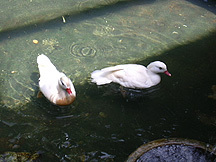 This extravagant rose quartz mandarin ducks (one male and another female) are beautifully tied together as a love amulet. This love amulet is suitable for those who are seeking to spark up a new or existing love life. It is beautifully strung with high quality tassel strings onto a rose quartz mystic knot. The mystic knot carved out of rose quartz is the most influential symbol of endless love in Period 8. Those wearing or displaying this powerful mystic knot symbol will have the influence of the number 8 multiplied, thus enjoy extra good luck endlessly. Mystic knot is also equivalent to the infinity sign done endless times. When these two symbols of love are combined together and carved in the love gem rose quartz, it will harness the maximum love energy that is long lasting. Rose quartz is popularly known as a universal love stone, and its fire energy hidden in earth element will help to enhance ones love luck, especially great if displayed in the universal love corner southwest. For the ladies, this amulet could also be carried along with you all the time by tying it outside your handbags. This product can be also be hung in cars and bedrooms to multiply your love and relationship luck throughout the Period 8. 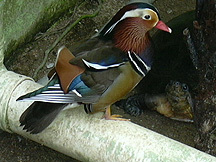 What Mandarin Ducks and Mystic Knot symbolize? The mystic knot also brings the calming effects to subside your anger. Each time you feel your temper rising, visualize by holding the knot quickly and your anger will subside. It is therefore an important item to be carried along in offices, homes and cars. If you are travelling offshore or faraway, the mystic knot will also protect you against accidents and danger, including robberies, burgalary, kidnaps and any other kinds of danger. Visualize and hold the mystic knot everytime you feel frightened and it will lighten the fear.